Today, on the anniversary of his death, June 13, 1231, Catholics around the world celebrate the life of St. Anthony of Padua, the Franciscan preacher, confessor, and friend of the poor and the sick, known as the patron saint of lost things and lost souls. 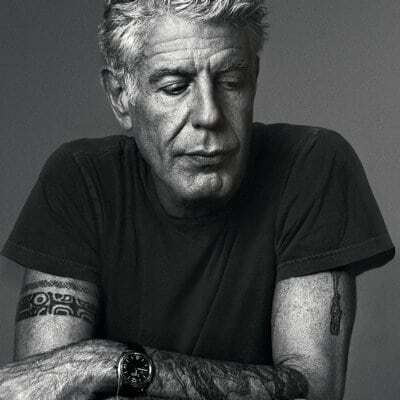 What better time could there be for a “feast” day remembering our own St. Anthony of Bourdain, a soul survivor of the inferno of culinary commerce and a mortally wounded cynic who raised himself from the dead world of drug abuse and self-loathing to be transformed and to help transform others from lost wanderers into committed and compassionate pilgrims. By Catholic standards, of course, he was not even a sous-saint. But to the millions of followers who revered him, Anthony Bourdain, though not a holy man, was a wholly venerable everyman. He was a postmodern preacher and friend of the poor who, like Virgil leading Dante across the eternal expanse, showed us all the tragic and glorious realities of humankind through the poetry of food and family in far-flung places. As for any framing of his work in metaphysical terms, however, he would have bristled. His naked honesty prevented him from trafficking in hipster platitudes like “I’m not religious, but I’m very spiritual." Bourdain made it crystal clear: he didn’t believe in God or gods or higher powers or cosmic forces. But true to his heart, he treated everyone who did with respect, from the evangelical whites of Appalachian West Virginia, to the Zionist Jews of Israel’s West Bank settlements, to the worshippers in the Santa Muerte death cult in Mexico City. He elevated their lives and illustrated, through exploring their cultures and their cooking, the commonality of the human spirit across all boundaries of race, religion and geographic origin. And through his confessional style, he miraculously deconstructed the tired conventions of the travelogue and the cooking show forever, creating not only a new format, but combining them into an entirely new television form. “Tony, we more than knew ye,” because you coped by turning your insides out. Maybe that’s what made it so increasingly hard for you to bear the weight of being St. Anthony of Bourdain to your millions of admirers. I don’t know. I only know that the guilty pleasures of living vicariously through the rolling disclosure of your soul and steadying my rolling stomach as I watched you graciously taste even the most distasteful of dishes make this loss poignantly sad. As a comfort, I’ll take a pinch of solace from the fact that yours was a life intensely and intentionally lived, even though in the end, it was just as intentionally taken. Wherever you are, St. Anthony, I thank you for sharing that life with me. I’m a more knowledgeable, more broad-minded, and more caring human being because you were here.